by doublespringschurch.In Grow.Leave a Comment on How Do I Choose A Bible Translation? I LOVE that question for a number of reasons. One reason I love it – it means people have Gods Word on their minds. They are thinking on spiritual things and thinking on spiritual things is always a good thing! Two, it means that there is a desire to grow spiritually, to mature in the faith. In short, I love this question! 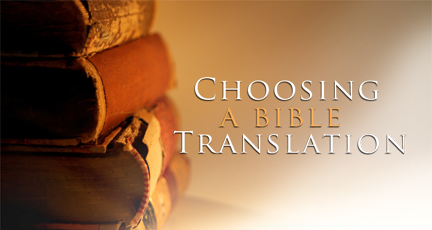 The nitty-gritty of it all – choosing a bible translation is a pretty daunting task. If you don’t believe me, go to your local bookstore and ask the salesman to take you to the Bible section! You’ll find a sea of translations (all usually claiming to be the “best, most readable, accurate, faithful” out there). This fact alone leads many to be overwhelmed. Yet, unless you are well schooled in reading Hebrew Koine Greek and a little Aramaic (the original languages of the bible) choosing an English translation is a “must” if you are going to grow in your faith through the study of the Word. So, how do we do it? Well, let’s do some groundwork on translations. The first thing we must understand is that if the Bible you are reading is in the english language…it IS a translation. Moses, Solomon, Peter, Jesus…didnt speak The Kings English or the modern form of english that you and I employ in every day conversation. Every english version of the Bible, no matter how dated, is a translation. Every one. So the idea that “I’ll pick the original” is out of the question unless you can read and comprehend the language of the Old or New Testament. The real question most ask when searching for a translation is, “Is this a good, readable translation?”. Thats what we’ll deal with here. 1. Formal Equivalence (This means word-for-word translation) – In this version, the translators attempt to reproduce the Hebrew, Greek or Aramaic language word-for-word. Because this type of translation is as close as possible to the original text, it’s great for serious Bible study but does require an advanced knowledge of the language and historic setting (context) to fully grasp what the Word is saying. The problem for a reader who speaks modern english is that often the word-for-word translation can be really, really tough to comprehend…not because it’s unfaithful, but because it’s language, phrases and expressions havent been used in centuries. TRUTH IS – not one version (no matter their claim) actually translates the original manuscript in a literal word-for-word manner. They attempt to get as close as possible but they do not actually translate each word literaly. If they actually did so, it would be incomprehensible in english (old or modern english). Even the old standard, the KJV 1611, arranges the original word order, smooths out grammatical difficulties and inserts modern language into the text to make it readable. 2. Dynamic Equivalent – the dynamic equivalent loosely translates the original language with the intention of making it more user-friendly. Instead of attempting to translate the original word-by-word, the dynamic equivalent will take phrases or thoughts and put then in modern english. The dynamic equivalent is very easy to comprehend but it does lead to a good bit of interpretation instead of translation. 3. Free Translation – This version is not really a translation at all but a paraphrase. The Free version is not so much a translation of the original text or even original phrases but the authors interpretations. The author re-words passages with good intention but often the details of the passage are lost and of course, the author being imperfect…his interpretations are subject to imperfection as well. These versions are suitable for personal devotion but I do NOT in any way, shape or form recommend them for serious study and certainly not for teaching/preaching purposes. A good example of this version would be Eugene Peterson’s “The Message”. So typically, This Is how Bibles are Translated – the Question Remains – How Do I Choose A Translation? *Will this Version Make Sense to Me? – Seems as this should go without saying but I’ll say it anyway…”If it doesn’t make sense, you wont be likely to stick with reading it”. It is of extreme importance that you understand what you are reading and because we are all at differing levels of spiritual maturity and even intellectual capacity, we need to be kind of picky here when it comes to choosing a particular translation. It very well may be that you’ll find yourself “graduating” over time to a more complex version as you grow in your faith but if you’re just getting started…do NOT be embarrassed, belittled or ashamed of the translation you choose because it’s readable to you. A few years back, I led a grown man to Christ who had little education and no Biblical background. He came to me weeks after and he was broken and frustrated because he wanted to grow in his faith but simply couldn’t understand his Bible. I gave him one of my kids Bibles. He got it! He began to grow…then “graduated” to an adult version eventually! You tell me, would it have been better had I told him to press on because he’d “figure it out”? I’ll answer…no. He’d had put it down in frustration eventually and chances are, not be the serious student of the Word that he has grown into today! When choosing a translation, consider where you are and find one that you can understand and grow in! Let me give you a quick example. Take the King James version of scripture…I love it! It’s beautiful and poetic and elegant. As a matter of fact, most of the scripture I have memorized is stored in my noggin (better yet, heart) in the Kings English. The KJV is a treasure…but it’s language is archaic. Since 1611, the english language has changed dramatically and the wording the Kings translators used is simply centuries out of circulation. Remember, the KJV is not the original, it is a translation of the original text into the language of the day, and now that language has had a complete overhaul. Thats not to say the KJV isn’t accurate, it was accurate to express what the Bible was saying in a way that the generation that existed in 1611 could understand…but it’s not accurate in doing the same in a generation like today, where language is dramatically different. How about Amos 4:6? In the KJV it states that “And I also have given you cleanness of teeth in all your cities…”. Again, the modern reader may be left wondering why God was concerned with the dental hygiene of those who lived in the metropolitan areas. So the modern english translations come along and help us to understand this to mean “I gave you nothing to eat”. Because the English language is spoken by 1.3 billion people in diverse context, it has (and continues to) rapidly changed. Common words or expression once used are simply no longer part of every day speech. This is why the KJV is worded the way it is and that why we have modern translations that are worded as they are…because if you are going to get anything out of your Bible study, you must be able to understand what you are studying. *Is This Translation Faithful – again, try as you may, you will not find an english translation that is literally a word-for-word translation all the way through. But there are many that are faithful to the text. We have to be picky again here because some translators come to the table with particular agendas. Sadly, some translations have denominational ties and leanings or even political agendas. For this reason, it’s wise to research the motives of the translators. *Can I Use Multiple Translations? YES! I do and truthfully, I recommend it! I have almost every translation on the market and I find that they often complement one another in fantastic ways and The Holy Spirit uses them to shed light on things they have been hidden to me. If you have been using an older translation like the KJV for years and love it…DO NOT PUT IT DOWN! Continue to use it as your primary study Bible and use other modern translations to supplement it! I Get it – I’m a simple dude. I need a readable translation. I have found that in the HCSB. I’ve yet to come up on a passage that I didn’t get because of a language barrier and that is very important to me. The HCSB uses the 21st century speech pattern that I use myself (as well as the congregation that I Shepard and my family). I get it. That matters! Dr. Albert Mohler, President of the Southern Baptist theological Seminary has said that because of its diligent translation into the modern english language, the HCSB is the translation that is least likely to need revision over the next 100 years (even as language continues to evolve). I love the attention to detail that the HCSB employs. Take for instance the Word “doulos“. In the original greek it means “slaves” and that is the way the HCSB translates it. Other translation use the word ‘servant” instead. See the difference? A servant is employed by his master and can throw up his hands and quit at anytime. A slave BELONGS to his master. The HCSB also uses the name of God in the Old Testament, “YAWEH“, where most translation insert the word “Lord” instead. One is the personal name of God the other is a title. That often changes the way we read the text. It matters. Lastly, the HCSB has a one-of-a-kind translation philosophy. It’s called optimal equivalence. Without bogging you down with details, the translators understanding that there is really no way to produce a fully literal translation or fully avoid the danger of personal interpretation of the original text often produced through dynamic equivalence they sought to find a perfect balance of both. Readable and accurate. At the end of the day we know that we must have a daily dose of the Word if we’re going to become mature, fully developed followers of Jesus Christ and to do that we need to prayerfully choose a translation that is readable and reliable. Choose wisely and grow in your faith! If I can ever be a help to you regarding this subject or with help in understanding your Bible (whatever translation you may be using)…feel free to contact me. It’d be my pleasure!